Are Modern Hymn Arrangements Fruitful or Frustrating? We recently visited one of the congregations in our Association during a quick weekend trip to Minneapolis, MN. During the worship service we were introduced to songwriter and worship leader Brenton Brown’s new ?”Joyful (The One Who Saves)”? which incorporates the beginning words from the hymn “Joyful, Joyful, We Adore Thee” and melody from the Beethoven’s ?Ode to Joy? from the his 9th Symphony. I had heard a preview of the worship song when Brenton gave us the opportunity to listen online when the album was released and enjoyed it. I liked it even more in a congregational setting. However, my bride had a different opinion. I asked what she thought about it and she said, in a nutshell, ?”Don’t mess with the hymns. You can add a chorus to them, update the arrangement, but don’t mess with the melody.”? What she was referring to is that some of the words in Brenton’s version are changed from part B of the melody to match part A and it threw her off. She also said ?”There are so many more good words in that hymn, why did it just repeat the first part? Why are we afraid to say more instead of repeating what was already said? ?” While the debate about repeating verses and choruses has been around for a long time, her point is that even some modern worship music still doesn’t “dig deeper” as much as it could. I also posted a mini-survey on I am an Offering’s Facebook page asking what people preferred out of traditional hymns, modern hymns, updated hymns and contemporary worship music. While this was by no means a conclusive survey I did find it interesting that the majority of the people answering chose traditional hymns. I would love to know your thoughts. Please do not attack Brenton’s song itself, as that’s not my intention and I believe Brenton had a fantastic heart behind putting these lyrics and original melody into a modern setting. I want to know what you think about ?”messing” with hymns? in general. I understand that many hymns were originally set to multiple tunes and have even changed tunes over time, but when certain melodies have passed through centuries without being changed what is the benefit of changing them? Does it create freshness or frustration? Is it our lack of a worshipful heart that’s frustrated or is the vehicle of change frustrating our mode of remembrance? Hey Ryan, Great Post! I really appreciate you expressing this point of view. In my view all hymns are not created equal. There is a body of work – the classic hymns texts with classic hymn melodies that, IMO should be perpetuated intact, as they have been traditionally known. The ones that are great art and connect us with our roots. A Mighty Fortress, O Sacred Head, For the Beauty of The Earth, Holy Holy Holy, My Jesus I Love Thee, etc. Hymn tunes such as Hyrfrydol, Old 100, St Annes – should be passed on to the next generation. It’s a type of musical preservation. Rewrite a great melody by Bach, Beethoven or Handel? Kind of ludicrous. That being said, I think there is plenty of room for continued re-discovery and experimenting with the hymns. Thanks for the post. I like your blog. That’s a really great perspective, Rob! I’m right with you on that one. It was interesting that in this particular instance with Brenton’s song that he didn’t rewrite the melody per se, he just set part B to part A. It still kind of threw us off though, as we’re so used to singing particularly words with part B. The “time-warped” comment is interesting. It’s fascinating to me that some music transcends time and some music defines time. Love the post and thought I would give my two cents, if that’s cool? I have used these in worship before and are quite effective. I think recycling/rearranging older hymns for a newer generation are wonderful and I don’t think it dishonors the Father as long as all of the lyrical content point to Him. And that’s the focus, right? Westminster Catechism asks “What is man’s chief end and purpose? To glorify God and enjoy Him forever”. I try to live by that and in doing so, I think God’s cool with me sharing new versions of previously written praise songs. Great post, and I think that the rearranging of older hymns, and the writing of new (ala Soverign Grace Music/Matt Papa) hymns are great in carrying on a tradition of ushering people into the quiet, or loud! LOL!, place with the Father! Thanks so much for sharing your thoughts, Jason! I’m glad you felt free to comment and thanks so much for the link to your album. I’ll definitely be checking it out. I’m a huge fan of new hymns myself as well (Stuart Townend “In Christ Alone”, Keith and Kristine Getty (also “In Christ Alone” and “Communion Hymn”, “Come People of the Risen King”), and definitely Sovereign Grace (I particularly love “All I have is Christ” right now). I think the issue that I began to struggle with after my wife mentioned it was the “fine line” between rearranging and updating hymns to a modern setting and whether or not they can be TOO updated. Thanks for adding your thoughts! Bottom line, it doesn’t matter. Hymns can be changed or unchanged… some people will like it and some people will not, and lets face it…this is all about personal preference and has nothing to do with spirituality in any way. I think you’re right, Jeff, but I wasn’t trying to imply that it has anything to do with spirituality. It DOES have a huge impact with how we serve the congregation as worship leaders. One purpose of a worship leader, to me, is to skillfully serve the congregation in the process of pointing hearts to God, and, yes, while you’re right that preferences can be much too strong at times, I think there’s a time to consider preferences tactfully as well. Do you disagree? I’d love to hear more from you! I don’t disagree with what you’re saying. I will say that, as a worship leader, I give up my personal preferences on a daily (weekly..) basis to better serve our congregation. If I had it my way we’d lose every element of traditional worship and go full force modern. But it’s not about me. At the same time, at our church, we do not have a traditional, liturgical service anymore. Our hymns are of the modern, rewritten variety. Our people respond well. What I guess I am saying is this… We have people in our church who love traditional worship. And those people are just as important as the other people (myself included) who love modern worship. So for us, no matter what we do…we’re not going to please everyone. So if through prayer and using my gifts of discernment, I will decide if we are going to sing a hymn that has been rearranged or if we are going to sing a hymn as it was originally written. And I decide this based on what I think is best for the congregation, not on what I think the congregation will like the best. Right on, Jeff, good clarification. Our Congregation has two different services – a “blended” service and a “contemporary” service. Thinking about music styles as “language” has been very helpful for me and my congregation. In the Blended service, it just makes sense (and works) to keep the hymns as written – words, music, harmonies, everything. That is their heart music/language, and if we change it on them, they literally don’t understand it. In the contemporary service, on the other hand, we often play with time signatures, harmonies, arrangements, etc, to make the songs fresh for the next generation. This way they still learn the time honoured words and melodies, but the songs are presented in a way that they understand. I believe this is VERY important. If we ever go back to identical services, it seems that doing a mix of modernized hymns and traditional hymns would be appropriate (as well as newer songs, of course). You can’t please everyone, but hopefully the songs honour the text and spirit of the service, no matter how they are done. I like the concept of a musical language. That’s very interesting. Do you think it’s beneficial to try to teach the language of both parties to each other so that they can “speak” to each other in the same language instead of being divided into two parts in the church? I’ve always struggled with having two different types of services just for the sake of unity. Thanks for adding your thoughts! Thanks for the post, and for starting the discussion! It seems to me that just as with the hymns themselves, an arranger can do a good job of rewriting the hymn, or a poor job. Some re-writes work great, and some just don’t. Many hymns just started as texts, and then melodies added later. There’s nothing “sacred” about these melodies. I think it can be very effective when someone takes just the text of the hymn and sets it to a new melody. I also enjoy adding a new chorus (response) to an old hymn. I do tend to not enjoy, as much, when someone starts with a familiar melody and changes it. That does tend to just confuse, instead of enhance, worship, in my experience. But, if it’s done well, it can be done. In fact, in the hymn you referred to – “Ode To Joy”, if you listen to Beethoven’s original sympony (#9), the melody has that rhythmic jump in it that at some point, someone decided to take out; probably to make it easier for a congregation to sing. So, it can and has been done for centuries! It’s all in the craftsmanship of the arranger. A good example of that from today is “Glorious Day (Living He Loved Me)” by Casting Crowns. They took the words to the old hymn “One Day”, gave it a completely new melody, and it works great! Great thoughts, Barry. I have nothing to add! I think there is definitely a rich heritage in traditional hymns that is not being passed down as well as it could be, due to a push to “update” them, but at the same time, “updating” them does help to draw in a new generation. I enjoy singing traditional hymns in their original melodies (but w/ a faster beat) and adding in bridges to “update” them. A favorite “updated” hymn is “My Chain Are Gone/Amazing Grace” by Chris Tomlin (?). Thanks, Ashley! That is, indeed, by Chris Tomlin. Whether or not people approve of a classic hymn being changed, I can’t think of a single example of a classic hymn being changed for the better. I realize this is a completely relative statement, but to me it always feels like updates to the classics manage to strip out almost every redeeming quality while adding nothing of value. They seem more overproduced and superficial. To me it doesn’t feel fresh at all, but absolutely corny, like having Thomas Kinkade repaint the Mona Lisa. Hmm…while I can agree with you with certain arrangements I have heard many arrangements that I think have been very effective and tasteful. Also keep in mind that many hymns have gone through different iterations to get to how we know them today as well (hence the use of hymn tunes like Hyfrydol and others that were mentioned). But, I do think as important as it is to preserve the classic hymns and be sure a new generation proclaims their beautiful words, we have an infinitely creative God that provides infinitely creative NEW expressions of music as well. Even more than updated hymn arrangements I’m a huge fan of new, modern hymns that are being written. We have tried to teach the concept of musical language to the congregation as well as teaching songs from each other’s musical language. It’s hard to find a good time to teach the concept though – it’s not a good Sunday morning topic! The little bit of teaching we have done, formally and informally, has really helped bring unity and understanding. Also, it’s not as if the community in each service completely shares the same language – each individual has their own. But we try to understand the prevailing languages and teach them across the board. For our congregation, having two different services actually brought unity…previously having identical services was tearing the church apart. I hope that in a few years we can bring everyone back together. We’re slowly singing more and more songs from “the other service,” and having more combined services when we can. Eventually the goal is to do away with the different services, as you say, for the sake of unity. Very interesting, Theresa! Thanks so much for sharing! That is a great point. Some melodies are appealing for hundreds of years. Some are bla after 13 weeks. Indeed, Bobby, thanks for sharing your thoughts! 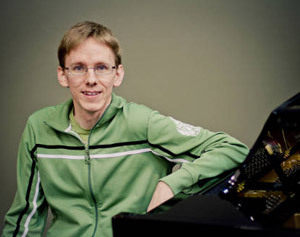 I, too, choose to either leave the melody of more popular hymns as unchanged as possible, though I prefer updating some of the language on occasion, however I would disagree with your wife (i think) in that I don’t think we need 7 verses to capture the essence of what makes a hymn deep. The problem with many old hymns is that there’s almost too much there – too many ideas – it’s overwhelming. What is good about modern worship is that it tends to get one thing very right, keeping the focus simple and clear. I’m all for depth, but my experience has been that often in hymns-only churches people just sing those songs because it’s what they’ve always sung – not because they understand the content. In part, that may be because their just too much content to take in. That’s all to say, I love love love rewritten, modernized hymns, but I do agree that we have to be careful with popular melodies. Matt Redman & Chris Tomlin’s “Wonderous Cross” is, in my not-so-humble opinion, is miles better than the original… likewise, Bob Kauflin’s “God Moves”… I’m sure I can think of others. I believe that sometimes, a new melody can breathe life into an old Hymn. However, like your wife stated, some of them just shouldn’t be touched, but I believe this is more of a personal attachment to the hymn than anything. Personally, I can’t stand the “original” ”Joyful, Joyful” melody. It is actually one of my least favorite hymns, but there are some hymns that I would not like anyone to mess with. I think over all, it is just personal preference of the hymn melody, which is ok, as long as this does not take away from why we worship. “God Moves” Yes! I love that version, so good! Fantastic thoughts, Shannon, I lean more towards your perspective as well. Aren’t so many things just a matter of personal preferences but we turn them into “doctrine?” My pastor recently preached on music and worship and talked about how certain melodies just “stuck” with the poetry more than other melodies. My wife then said, jokingly, “Yes, but it was God’s will that they stuck!” He then said, “Yeah, I agree, but I know I’m wrong.” I can definitely see where you’re coming from. While I agree with you, to a point, I think you need to be very careful here. I’ve seen many “older folks” who yearn for a more culturally relevant service and enjoy the opportunity to “rock out” because they realize it’s a language that younger generations understand. At the same time, you’re partly right about the fact that we’re often missing a reverence toward God. However, I’m seeing more and more that the younger generation is embracing a sense of awe and reverence toward God, even within modern music and style. Your Scripture reference is well and good, but don’t forget about David himself writing several times to “sing to the Lord a new song” as well as being seemingly “irreverent” as he danced in celebration as that same ark came back into Israel from the hand of the Philistines. The Bible is full of amazing tensions, and we always need to be careful how far we stray to one side or the other. I think that I would agree with your wife. I know that some of the melodies can be tough, but I think that singing them like that gives a spiritual aesthetic to the songs. People connect certain types of music as being “holy.” I know that sounds odd and goes against whole idea of not splitting the sacred/secular that is popular right now, but people really do connect with certain types of music and the emotive qualities they produce. That said, I think we should careful about teaching older songs and possibly updating HOW we play these older melodies. I was in a church in which classic methodist hymnody was the most appropriate, but they lacked the instrumentation (piano or organ) to do this music. But most of these where Appalachian mountain folk who had moved to the city. We were able to play these hymns with guitar and the occasional mandolin or banjo in the original arrangement. It kept the emotive qualities of the music, but also updated it in the process. The younger people in the church loved it and never really asked for us to do more modern worship. When we did, we would adapt the modern songs to the style that fit the older hymns (How Great is our God really worked well for this). I think that worship leaders would do well to study a little bit of musicology to understand how music does interact within the social space of congregations. Interesting perspective, Chad! So, are you suggesting that music, in and of itself, can be “holy?” I’m not sure if I can agree with that completely. Also, I’ve found (for better or for worse) that many people don’t find ANY emotive qualities in the older style of hymns. I think it would be a much better idea to do what groups like Sojourn and Sovereign Grace are doing and completely revamp the melody to go with the astounding original lyrics, probably not for very well-known hymns, but for some gems that people don’t necessarily know about. I found your sight by googling “messing with the hymns.” I googled this phrase because for the last two Sundays in two different churches, the worship teams “messed with the hymns.” Last Sunday it was the timing of “Blessed Assurance,” and this Sunday is was a whole different tune to “I am Thine, O Lord.” Sitting in the congregation, you could see and hear the confusion, and I don’t think that’s what worship is about. Rarely do we sing hymns anymore, so when we do, you can feel the congregation respond. It’s something familiar and they can truly worship, concentrating on God instead of words and music. That, in my opinion, is worship! Thanks for your comment! I believe there needs to be a good balance between old and familiar as well as new expressions of worship. We are called in the Psalms many times, after all, to “sing a new song.” We are also called to pass down teaching to our children and children’s children. I agree that minimal distraction is necessary to worship God fully, but at the same time, new expressions of worship (through new lyrics and music) can stir our hearts to understand God’s character in a way we haven’t before. I really like modern arrangements of hymns but when I say that let me qualify. I think that I’m with your wife on this one – a great modern arrangement adds flavor and flare that brings the hymn into the musical context of today without actually changing the basic components. So, don’t mess with lyrics unless they themselves are confusing or even (dare I say it…) theologically incorrect. Don’t mess with the basic melody line either – this is extremely frustrating to me because I love to sing and find myself singing out of place because I didn’t know what was coming. Some quality examples of doing it well – Chris Tomlin’s Wonderful Cross; Gateway’s Come Thou Fount, Come Thou King. These both keep the basic integrity of the original while making it feel both modern and ancient all at once, mostly by adding a chorus and slightly different timing. Personally, I say leave the hymns alone. Many hymns are hundreds of years old; they have withstood the test of time and become known and loved by millions around the world. So why do some songwriters feel they need to “refresh” them by adding new choruses and/or changing the original tune? Are the hymns somehow suddenly incomplete? Are the truths they teach us no longer true? Are they no longer good enough to convey God’s love for us and our love for Him? Many hymns were composed as the result of a particular event or the life circumstances experienced by the author. “Amazing Grace” reflects John Newton’s personal journey to salvation through God’s grace (and consequently the journey of thousands others through the centuries that followed.) Horatio Spafford was inspired to write “It Is Well With My Soul” as the result of several personal tragedies, including the loss of his four daughters in a shipwreck. It also disregards the feelings of those who love the hymns the way they are. It’s like reading your favorite book, one that you read over and over because you enjoy it and it speaks to you on a personal level, then suddenly finding someone else has added several chapters in the middle because they thought it would “refresh” the story. What was wrong with it in the first place? Many modern worship songs are fine (although I think some are repetitious and/or unsingable as a congregation.) And I have no problem with an arrangement of a traditional hymn that uses more modern instrumentation. But there is no need to add new choruses written from an entirely different perspective than the original work. Let those songwriters who have the desire to praise God in music and the talent to do so (and many modern writers certainly have the talent) write their own original songs rather than appropriate the works of someone else. I just came from a meeting where I was told that in our church the hymns were a “big, fat fail,” and that they should be modernized. I mean, “more than 4″ people have said that in our church . . . I am our Music Director, and we have what so many evangelical churches do not–a bona fide pipe organ. I was trained as a pianist, so when our previous music director passed away, I took lessons so that I could learn how to play. We have a blended service that is part praise songs and part hymns, but because some don’t connect with the hymns (Millenials all), now there is a push to change them. For me, this is like “Switched-0n Classics,” over which I cringed as a young classical pianist. 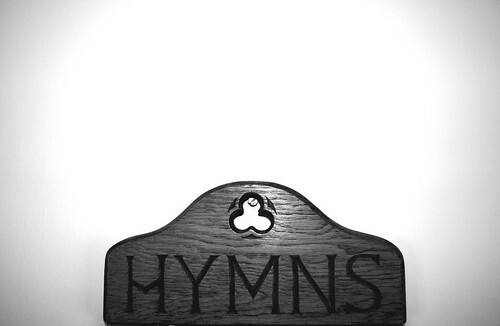 Hymns are a heritage–a music theology for the church, if you will. They are (generally) God-focused and directed “up” instead of what is so much of our contemporary music–”ME” centered–how I feel and what God means to ME. I find this myopic perspective not only disheartening, but–frankly–irritating. Narcissism is mainstream anymore, and my natural response as a student of theology is to nail a 95-music-thesis on the door of our church. . .
Bottom line? We’re already serving the needs of the young. For them to want it ALL is both selfish and unfair. I won’t compromise the heritage, the tradition, or the appropriate God-focus that is inherent in the hymns. Can we switch it up once in a while? Yup. But it should be the exception, not the rule.